Los Angeles County saw four home sales around the $20-million mark during September, including deals involving a commercial real estate mogul, a Netflixexecutive and a boxing champion. Here’s a look at the high-water sales. Floyd Mayweather Jr. wasted little time in spending some of the $100-million purse he received from his fight against Conor McGregor. The now-retired boxer was the buyer of a French modern-style mansion on North Crescent Drive that sold for $25.5 million. Developed by Nile Niami, the 1992-built residence was recently renovated and has nearly 15,100 square feet of refined living space. Features include mirrored wall fireplaces, a cocktail lounge/bar, a gym and a 20-person home theater. A swimming pool and spa, pool house staff suite, guesthouse and four-car garage also lie within more than half an acre of grounds. The French modern-style estate, renovated two years ago, sits on about half an acre in Beverly Hills. The property originally came to market two years ago for $38 million and was more recently listed for $28.95 million, records show. 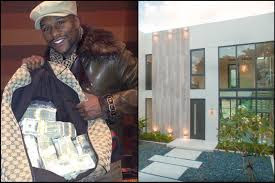 On top of the $25.5-million sale price, Mayweather paid another $500,000 for the high-end furnishings. Drew Fenton of Hilton & Hyland, an affiliate of Christie's International Real Estate, was the listing agent. 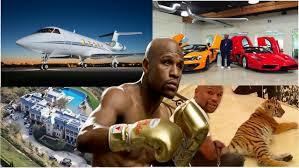 Nichelle Robinson and Barbara Robinson, also with Hilton & Hyland, represented Mayweather. In the 100 block of Bliss Canyon Road, a Palladian-style mansion that was once listed for as much as $78.8 million sold for about a third of that price. The 35,000-square-foot home, which took commercial real estate magnate Donald Abbey nine years to build, is reached by a hand-cut, rock-wall driveway that ends at a massive porte-cochere. Beyond the arched front doors are scaled formal rooms with 40-foot-high ceilings, a two-story library and a 2,000-bottle wine cellar. Domed ceilings feature hand-painted frescoes. A total of seven bedrooms and 10 bathrooms includes two master suites. The Palladian-style mansion, which took nine years to build, sits on an eight-acre promonotory in Bradbury. Expansive loggias open to a swimming pool shaped like a stylized cross. A spa, a pool house, a temperature-controlled pond and a subterranean firing range also lie within about 8 acres of grounds. Joshua and Matthew Altman, the Altman brothers of Douglas Elliman, were the listing agents. Runjing Chen of Coldwell Banker Residential Brokerage represented the buyer. A bluff-top estate formerly owned by British hotelier Paul Kempin sold on Cliffside Drive for $2.75 million less than the asking price of $25.75 million. Set behind gates in the Point Dume area, the European-vibe house has seven bedrooms and 7.5 bathrooms in nearly 7,700 square feet of living space. A two-story entry with a floating staircase sits just beyond the front door and opens to separate living and dining rooms. The master suite, which features an ocean-view terrace, and four en suite bedrooms make up the second floor. Outdoors, more than an acre of park-like grounds includes various patios, a barbecue island and a swimming pool and spa. Mia Trudeau of Hilton & Hyland and Chris Cortazzo of Coldwell Banker shared the listing. Cortazzo also represented the buyer, a corporate entity with a tax address based in Switzerland, according to public records. Ted Sarandos, chief content officer for Netflix, paid $5 million less than the original asking price for a roughly 4,640-square-foot home on Pacific Coast Highway. The modern Italianate-vibe house sits behind walls and gates and has a private funicular that leads to the beach. A swimming pool and spa, an outdoor lounge and a two-bedroom guesthouse also lie within more than half an acre of grounds. The three-story main house devotes the majority of its square footage to open-plan space and has a free-flowing living room, dining room and chef’s kitchen on the main floor. Pocketing glass doors open to expansive terraces for indoor-outdoor living. Chris Cortazzo of Coldwell Banker was the listing agent. Jonah Wilson of Hilton & Hyland represented the buyer. A newly built home on South Burlingame Avenue in Brentwood Park sold for about $2.7 million less than the original asking price of $19.995 million. Three years ago the half-acre property sold for $5 million, records show. The Georgian-inspired traditional-style home, designed for small- and large-scale entertaining, features amenities such as a putting green, a lanai with a fireplace and a saltwater swimming pool. A poolside cabana holds an outdoor kitchen and an additional bath. Some 13,050 square feet of neutral-tone interior includes a two-story entry, a chef’s kitchen, a library, a music room, seven bedrooms and 12 bathrooms. A two-way marble fireplace sits between the living and dining rooms. A lower lounge holds a home theater, billiards room and sports-themed bar. An elevator services each of the home’s three floors. Ernie Carswell of Teles Properties and Cassandra Bloore of Vista Sotheby’s International Realty were the listing agents. Oliver Mossi, also with Teles, represented the buyer.